I’m in the market for a new set of non-stick cookware for my kitchen, and I’m wondering which type is healthiest? Non-stick cookware cleans very easily and some health-conscious cooks appreciate that it requires less cooking oil than uncoated varieties. But the convenient cooking surface comes with potential risks when it is used with high heat. At temperatures exceeding 500 degrees Fahrenheit, the synthetic fluoropolymer coating in Teflon non-stick cookware begins to break down and release toxic perfluoroalkyl substances (PFASs) into the air. The Good Housekeeping Research Institute tested how quickly three different non-stick pans (lightweight, medium and heavy) heated up to 500°F. Scrambled eggs cooked on medium heat for three minutes in a lightweight pan peaked at a safe 218°F, but all three pans heated on high reached temperatures above 500°F in less than five minutes. The cheapest, lightest pan of the three got there in under two minutes. Even with oil added, the cheapest pan surpassed the 500°F mark in two and a half minutes. Cooking steak in a lightweight non-stick pan yielded a pan temperature exceeding 600°F in less than 10 minutes. 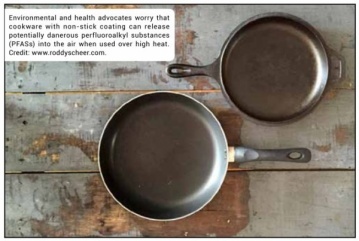 At temperatures of 660°F and above, non-stick coated pans may emit fumes strong enough to cause polymer-fume fever, a temporary flu-like condition with symptoms such as chills, headache and fever. While the fumes aren’t fatal to humans, they can kill pet birds. The Environmental Working Group (EWG), a non-profit focused on health and the environment, recommends cast iron and stainless steel cookware as safer options for stove top cooking, and oven-safe glass for baking. Highquality stainless steel pans are durable and can last a lifetime if treated with care. They also have greater searing and browning capabilities than nonstick pans while still being relatively easy to clean. Cast iron creates an even, intense heat that helps seal in juices and keeps foods moist. Cast iron is also more versatile than non-stick cookware, as it can go from stove top to oven. While cast iron is heavy and needs to be seasoned - a process that involves coating the pan in oil and baking it - it is a more affordable option than stainless steel. Cast iron is also scratchresistant, so any kind of utensils can be used when cooking with it. While there are a growing number of new cookware options on the market, including ceramic options advertised as a zero-toxin, eco-friendly alternative to Teflon, EWG reports they don’t know enough about them yet to be certain they live up to such claims. Keep in mind that any non-stick cookware you currently own that’s not chipped and in good condition can still safely be used with foods that are quickly cooked on low or medium heat, like eggs or pancakes. But if you’re buying new cookware, the experts agree the best way to play it safe would be cast iron for stove top cooking and glass for baking. CONTACTS: Good Housekeeping Research Institute, www.goodhousekeeping.com/institute; EWG, www.ewg.org; GSPI, www.greensciencepolicy.org.